Affordable housing developer P.A. Alvarez Properties, recently broke ground on phase 3 of its 33-hectare project, Bridgepointe Place in San Fernando, Pampanga. This kicks off the construction of 158 bungalow-type housing units: the Iris model, which has a 60-square meter lot area and Natalya model, a 96 square meter lot area. Bridgepointe Place is envisioned to be a community with 3 enclaves: phase 1 is 14-hectare Sandsfield which is an Asian inspired community; 10-hectare Midori Garden which comprises phase 2, which has a Japanese-themed architectural design; and 9-hectare Trillium Park, or Phase 3, which will feature a contemporary design. Bridgepointe Place is P.A. 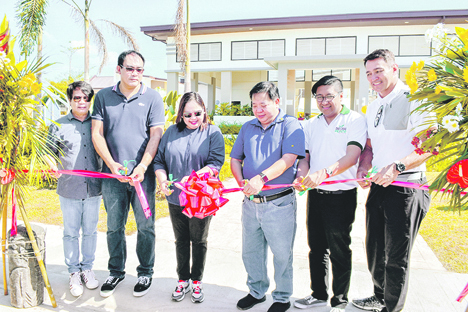 Properties’ first project in Pampanga and its third project North Luzon. At the groundbreaking were P.A Properties’ SVP Lilit Tabuzo (third from left); and senior executive vice president Reynaldo Ascaño (third from right). Guests included former basketball players Nelson Asaytono and Vince Hizon.